Our LifeGroup Bible Study Group uses LifeGroup Bible study guides and other guides to shape their conversation about different books of the Bible or topics that help one grow in faith. 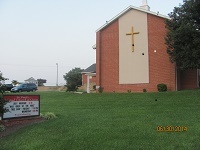 The group is self-directed and meets on Sunday mornings at 9:00 am in one of the church’s meeting rooms. Our Sharing Yarns ministry gathers to provide hope, love, and healing for people in our community through the work of the participant’s hands while exploring our own relationship with God through knitting and crocheting. The group meets on the second Tuesday of the month from 9-10:30 am, September through June, in our church parlor.Knitters and crocheters of all proficiency levels are welcome. Creating prayer shawls and throws for those facing chronic or long-term health issues is an ongoing project of our Sharing Yarns group. Every year, the group also selects an outreach mission to share their handiwork with such as: the UCC Rainbow Scarf Project to raise awareness about violence, especially bullying against LGBT youth and young adults; winter scarves for Heidelberg UCC's community breakfast mission; preemie baby hats and blankets for York Hospital's NICU & Newborn Nurseries; and wraps for the Gift of Life Donor Program. At St. Paul’s UCC (Stoverstown), we don’t just believe our kids are the future—we know they are the NOW. We endeavor to serve them as a vital and integral part of our community and as gifted and growing spirits. Our Church School teaches our kids the values of our life together. They live important Bible stories, explore rituals that comfort them and offer them structure and meaning, get a feel for the rhythms of worship, sing and learn what it means to be a beloved part of our faith family. Our kids LOVE Sunday school and church so much they ask their parents to come back again and again, and often have to be coaxed to leave hours after worship has ended, before their last game of tag in the sanctuary is over! Church School begins at 9 am and ends at 10 am. Every Sunday, kids come to worship with their families for All Ages Worship. The nursery remains open to kids 3 or under. Parents with infants are most welcome in worship on Sunday. As they get older and as you get more comfortable, you can leave your little ones in our Infant and Toddler Nursery. We’re here to help you with separation anxiety, so don’t be afraid to ask. Kids usually transition from the nursery to Church School at age 3. We currently run a one-room Church School. Our Sunday School teachers meet with the students for 45 minutes and for 15 minutes they gather for singing. Our youth group for grades 6 and up meets about once a month for fun, service projects and conversation about things that really matter. For more information, email Joy Gobrecht (joy101198@aol.com). We offer events throughout the year that bring all of the generations of the church together, from Sunday morning conversation time and worship to Advent dinners, Easter breakfast, and outdoor movie nights during the summer. Everyone, no matter their age, has something to teach us about being God’s children and growing in God’s ways of love. Our music ministry both contributes to the worship experience and is open to all who desire to participate. Our Shalom Choir (Adult) is open to high school and college students, and adults and sings regularly during the worship service, September through June. We sing many different styles of anthems. You don’t have to be able to read music. If you like to sing but are not able to commit regularly, you are welcome to join us for those times you are available. Practice is on Thursday evenings at 7:00 pm. Our Agape Band and Singers lead the congregation during worship the first Sunday of each month. The band is comprised of guitar, keyboards, woodwinds, and drums to accompany the singers leading the congregation in several contemporary selections. The band has been known to appear at other special events in the area. Practice is on Thursday before the first Monday of each month at 7:00 pm. Woodwind, brass, and percussion add to the worship experience during other special seasons and events. Instrumentalists of elementary school age and on up are encouraged to offer their services to our praise and worship of God. Please consider dusting off any instrument you might have and joining in sometime. Our St. Paul's Players band practices primarily for the Christmas season. We create arrangements so instrumentalists of any ability can play. Our brass players usually provide music for our Easter Sunday worship. We celebrate Communion 11 times throughout the year. Anyone who wishes to experience Christ’s presence is welcome to come to the Communion Table. No one is excluded. Yet parents are the ones to discern whether their young children should receive Communion. Children whose parents decide they are not ready to receive Communion, but who come forward to the chancel with the rest of the congregation, will receive a blessing from one of the worship leaders. Our 2016-2018 Confirmation Quest is designed for middle schoolers and begins this fall. No church background is required. The curriculum will be planned around the faith questions of the participants, and help them grow in their relationship with God and with other people. Since the journey of faith is a journey of life, and not just of the mind, our Confirmation Quest will encourage participation in key practices of faith including different forms of prayer, worship, service to others, and reflection on stories from the Bible. In May of 2018 participants will have an opportunity to confirm the promises of Christian faith their parent(s) or guardian(s) made for them at their baptisms, or to be baptized and affirm for themselves their own faith in the God they have come to know best in Jesus Christ. Just as coaches and schools expect a certain level of commitment from their athletes and students, so will be the case with our Confirmation Quest. The bulleted list below broadly indicates what you can expect over each year of this two-year journey. · Confirmands and parents/guardians complete questionnaires about faith journeys, faith questions, interests, and learning preferences. So you can learn more, we are planning an Orientation meeting following worship for you and your parent(s) or guardian(s) on Sunday, August 28 from 10:30-11:30 am.